The Guns & Hoses event is just a day away giving local law enforcement a chance to ho head-to-head in the boxing ring all while raising money for local charities and organizations. While thousands of spectators are expected to come out and cheer on their favorite side, many of the boxers stepping into the ring have their own stories to tell. For Robert “Butterbean” Ralph, stepping into the ring is what he loves. “I’ve never been one that’s really gotten nervous because I tend to only be scared of those things that can eat me,” says Ralph. 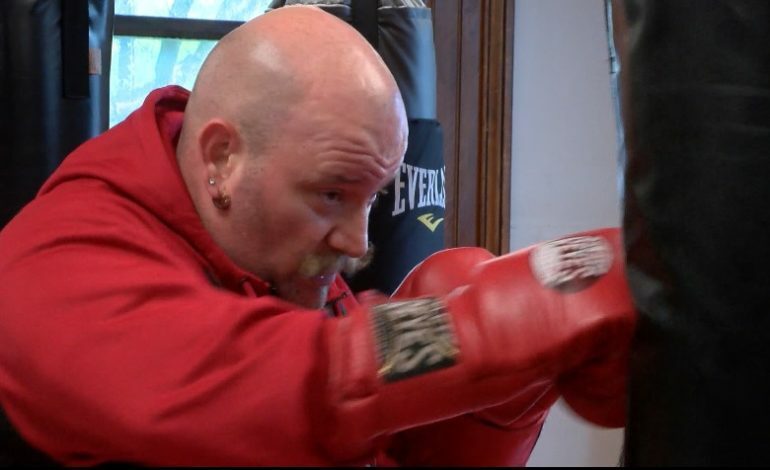 He’s an Evansville firefighter with 20 years of service including a seven to four record in the fighting arena. While training this year, he says he has a little more than the match on his mind. The Evansville Fire Department losing some of their own in the last few months. “So to the type of loses that we’ve had of course the one has taken his own life, definitely the dramatic medical episode that took Captain Jim Pauli from us, and without a doubt the severity of what happened to Robbie Doerr being murdered in his own yard hit real hard, real deep,” says Ralph. Dedicating their lives to their community. “You’re going to have those trigger moments that you know will bring back a memory where you might have been on scene with one of them, so just to have that heartfelt spiritual push from within to train a little extra harder, to put on a better show, to make sure our brothers are represented well,” says Ralph. And through pain comes togetherness. “I think it has kind of put a solidarity to this team this year that maybe we haven’t had in past years,” says Ralph. Stepping into the ring, Ralph knows along with the thousands of cheering fans, he will have three of his brothers on his mind and in his heart giving him that extra boost of support. “I’ve got I guess you can say a little extra inspiration that I’ll definitely be taking all of them with me and pops into the ring with me as well,” says Ralph. Ralph says he grateful for all the local law enforcement and their support for each other everyday. Guns & Hoses will start at the Ford Center Saturday at 7 p.m.